Tosin was a ‘street boy’ whose flair for marketing and relationship management served him well as a fast rising business professional. One of his company’s major customers, sent him an invite for their 10th anniversary commemoration dinner. Tosin was excited to be considered worthy of attending such a V-VIP event. His efforts were actually being recognised in the right quarters. However, there was a slight cause for concern. The invite read “this is a black tie event”, and he wasn’t too sure how to interpret it. He had attended many high-profile events and “Owambe” local parties in which the native “aso ebi” dress codes were specified. He was a smart dresser; most times relying on his instincts to swing-off any ensemble, so he never lost sleep thinking of any dress code requirements. But he had never attended this kind of event before, and knew if he were to make a good impression on his big customers and bosses that night, he had to show up looking prim and proper. Trousers should be cut for braces and of same material as jacket, except for white jackets which should go with black pants. 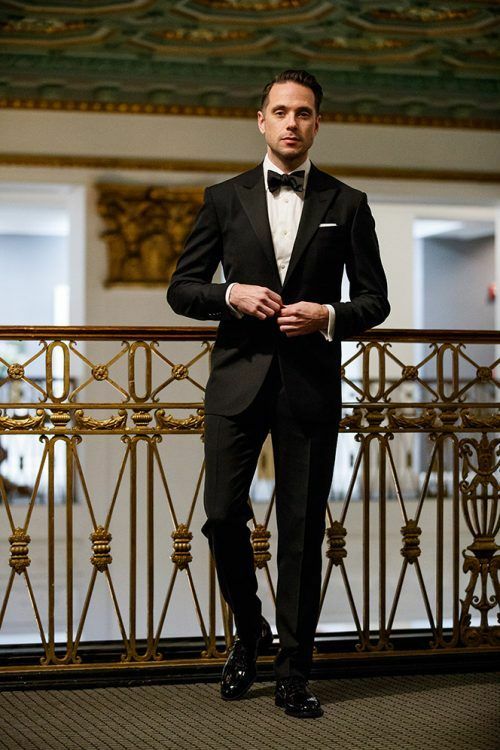 Accessories should include: silk pocket square and an optional black formal waistcoat or black cummerbund.